While it remains to be seen when the first trailer for Avengers: Infinity War will be released, a new cast member has just been revealed. Motion capture specialist Terry Notary, best known for playing the ape Rocket in all three of the Planet of the Apes prequels, confirmed in a new interview that he will be portraying Teenage Groot in the highly-anticipated Avengers: Infinity War, and presumably in Avengers 4 as well, which is currently in production. Here's what the motion capture performer had to say while promoting his new film The Square, when asked to confirm if he's joined Marvel's epic sequel. "Yes, I am playing teenage Groot. I'm having a blast with it. It's really, really fun. I can't say too much about him, but he's coming of age, so you'll see the teenager find a mentor to look up to and to model himself after. The character's great, and the films are going to be great. We've got such an amazing cast and a great pair of directors at the helm. The Russos allow the actors to jam on scenes together to the point where it just feels great and everybody gets their moments." During one of the five post-credit sequences in this summer's Guardians of the Galaxy Vol. 2, it was revealed that the adorable Baby Groot has grown into Teenage Groot. The scene featured Teenage Groot engrossed in a handheld video game, while Star-Lord (Chris Pratt) comes into his room and demands that he clean it. It was since confirmed that all of the Guardians of the Galaxy will have roles to play in both Avengers: Infinity War and Avengers 4, although it isn't clear how large their roles will be, or how they fit into the story. One thing is for certain, though, with Terry Notary playing the Teenage Groot, the character is certainly in good hands. Terry Notary made his feature film debut in an uncredited role as a Banshee in James Cameron's Avatar, before debuting as Rocket in Rise of the Planet of the Apes in 2011, which he reprised in 2014's Dawn of the Planet of the Apes and this summer's War For the Planet of the Apes. He also played a Goblin in The Hobbit: An Unexpected Journey and The Hobbit: The Desolation of Smaug, and the title character in Kong: Skull Island. He also serves as a second unit director on Andy Serkis' directorial debut, The Jungle Book for Warner Bros. and he serves as movement coordinator on upcoming movies like Rampage and The Lion King. With Avengers 4 currently filming, after starting production in early August, it isn't known if Terry Notary has already filmed his scenes as Teenage Groot or not. It's possible we could get our first look at Notary's work as Teenage Groot in the first Avengers: Infinity War trailer, although it remains to be seen when that will be revealed. 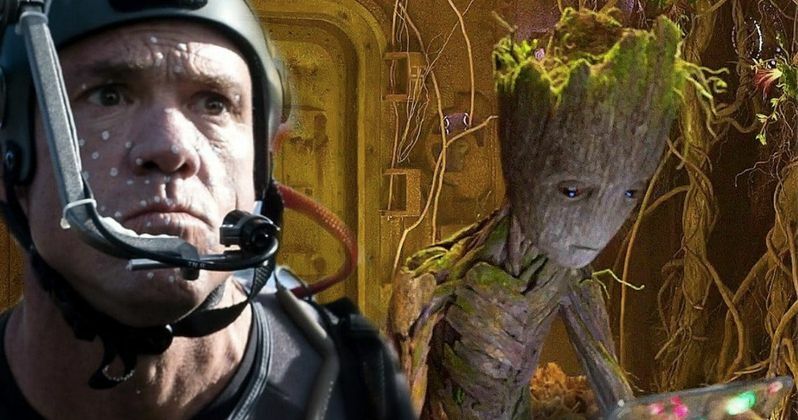 Terry Notary wouldn't reveal anything more about Teenage Groot in his interview with Yahoo! Movies UK, but hopefully we'll have more news soon.